Candy ads are supposed to be lighter fare, right? It’s candy. It’s supposed to be fun. 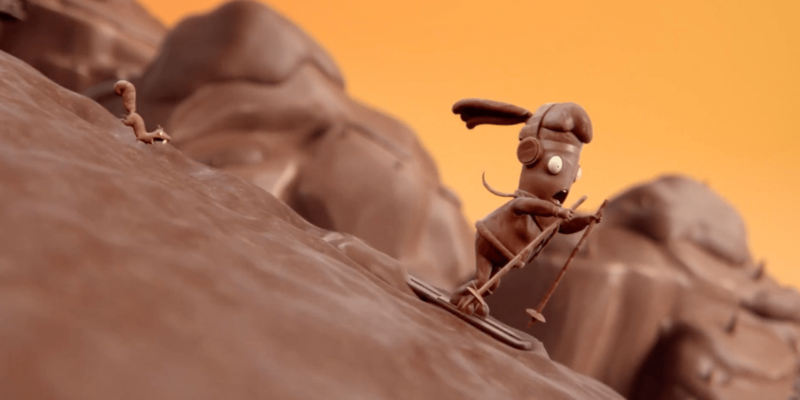 And, one could argue that new work out of Wieden + Kennedy Brazil for Mondelez brand Lacta is fun but, wow, talk about a grim way to market chocolate. “Chocolate World” for the Lacta 5Star bar is a series of ads where this community of confection is under siege by a raft of cookies, cocoa and caramel, the three ingredients in the candy. All of the spots grab your attention pretty quickly and, despite their graphic nature and dark storylines, are compelling to watch—but be forewarned, this might not be the candy advertising you’re used to. In one ad, asteroids, in the form of delicious cookies, destroy everything in sight, resulting in rivers of caramel. In another, an astronaut attempts to flee a massive baked boulder to no avail as a planet explodes into celestial caramel goodness. And, in probably the most graphic spot in the set, a skier tries to outmaneuver an angry squirrel, only to have his head snipped by a tree before falling into a lake of caramel. Each ad opens and closes with peppy and quirky music that somehow makes the ads seem much more innocuous than they perhaps are. Indeed, the animation from legendary Brazilian creative studio Lobo is stellar and, if dark comedy is your thing, then this campaign hits the mark in many ways. Regardless of your taste, there’s no denying that this campaign is entertaining, stands out among a sea of sweet treats that may not necessarily be willing to cross the line into the macabre—and could very well make a caramel splash in the south of France next June.